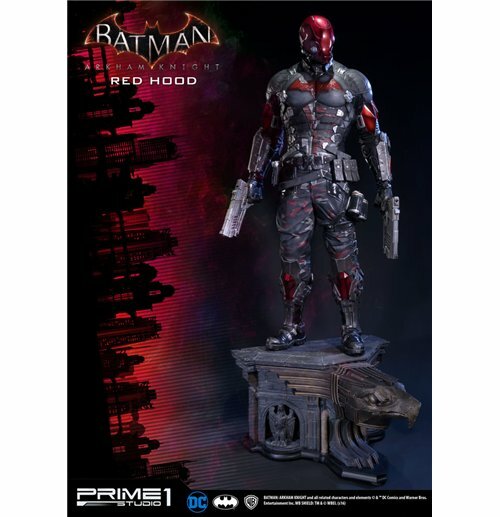 Prime 1 Studio is proud to present MMDC-09: Red Hood from Batman: Arkham Knight. The Red Hood was the alias of a particularly infamous criminal active during Batman's early years as the caped crusader. The Red Hood is most notorious as being the former identity of The Joker prior to his encounter with Batman. After he unmasked himself in front of Batman, and after he saw how much that Bruce still cared about him, he decided to help Batman, instead. He took on a new name, and became a vigilante once more and tried to put an end to crime under the identity of the Red Hood. He tracked Batman's movements to the abandoned Arkham Asylum and freed him from Scarecrow.Size: Approximately 82 cmLimited to just 500 pieces worldwide.Please note: Due to the size of this item, additional shipping costs may apply. Apart from your location, the actual package size and weight is needed to determine those costs. Both are unknown at this point and may not be available until the product arrives in our warehouse.